FACT: Bulbs of fennel in piles at the farmers markets are still young and tender, with mild flavor. FACT: The first fully-ripe apricots of the season have appeared in markets. FACT: Chicken salad is delicious. FACT: Thyme makes chicken salad even more delicious. This simple FACT salad (so-named for fennel, apricots, chicken, and thyme) was inspired by a pile of ripe apricots. Fruit is, of course, a nice addition to chicken salads and tuna salads and other branches of the protein-y salad family. I liked the idea of apricots with cold chicken, since it’s delicious to cook chicken with apricots or plums. 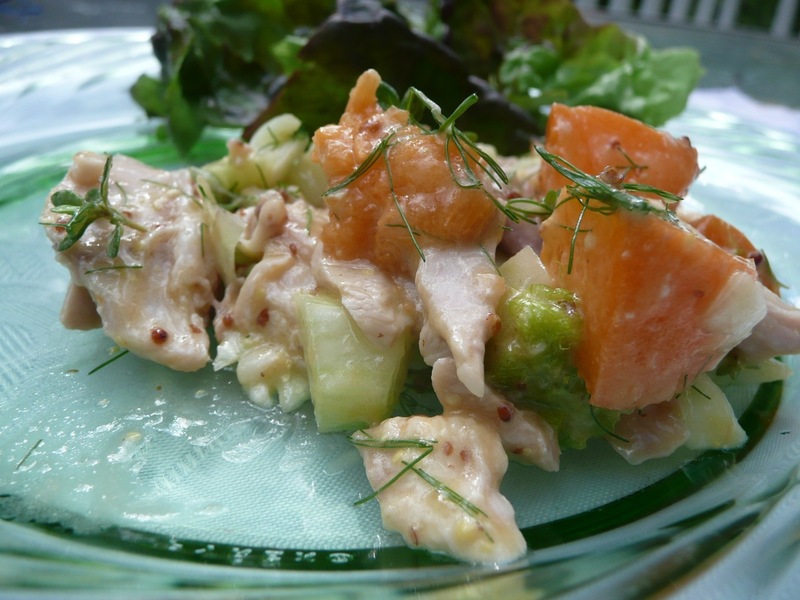 But I felt like a chicken salad with apricots also needed some sort of fresh crunch. Hence, the fennel. Add a bit of thyme, ideally lemon thyme, and some homemade mayonnaise, and you’re done. The salad would also work great with plums or pluots. half a small bulb of fennel, white part and a little bit of green stalks and leaves. a few spoonfuls of homemade mayonnaise (bowl recipe and food processor recipe). I made my mayonnaise mustard-heavy this time, and used both apple cider vinegar and lemon juice in it. I used the kind of mustard that has seeds in it, although that’s not necessary. 1. Cook the chicken thighs, or use leftover roast chicken. I roasted them at 450 with a few vegetables, some schmaltz, and a little white wine. Cool them. 2. 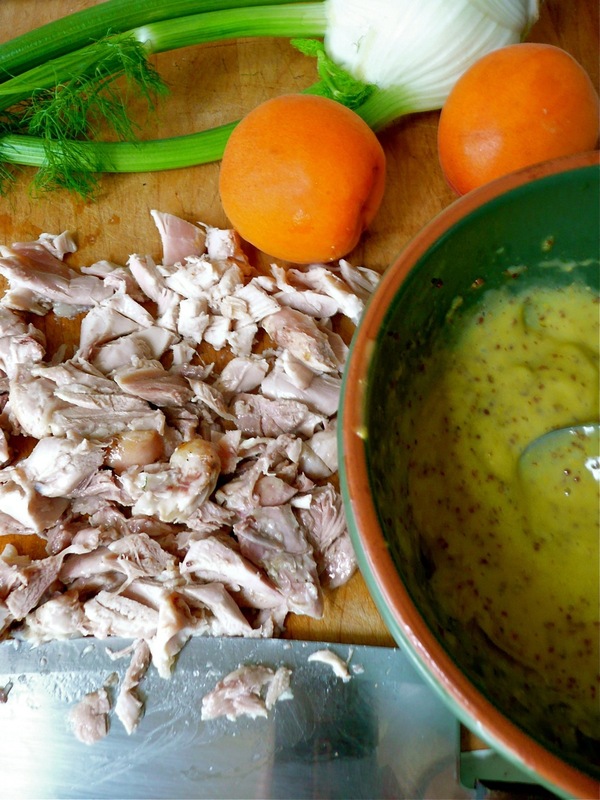 Chop up chicken, apricots and fennel into small pieces. Remove leaves from thyme sprigs. 3. Mix everything up with spoonfuls of mayonnaise to taste. I spotted some lovely yellow patty-pan squash at the Madrona Farmers Market on Friday. They were medium-sized ones, at least a few inches across. 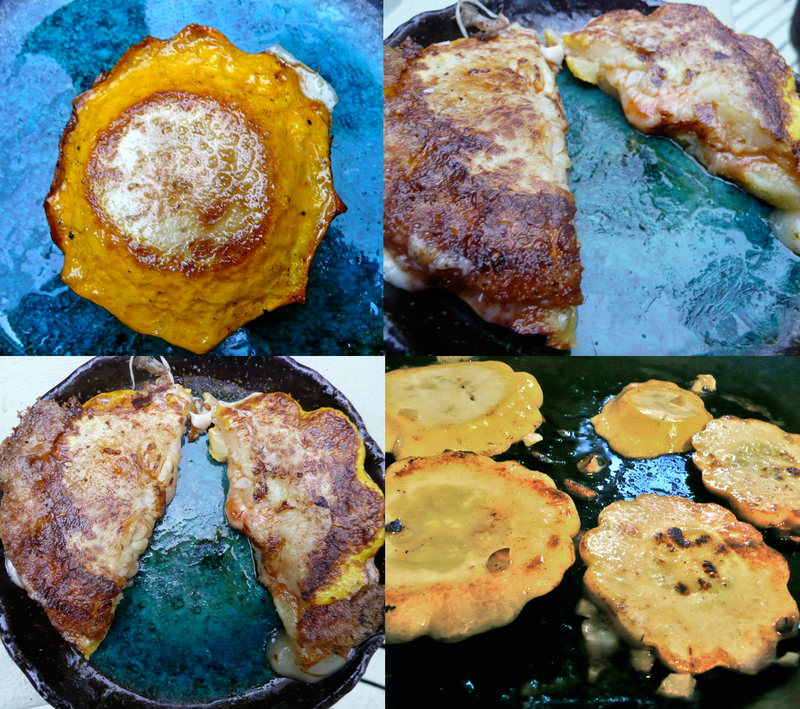 Usually I like tiny patty-pan squash –– I like to cut them in half or quarters and quick-sauté them –– but I wanted to try doing something new. And that something was grilled cheese. Or… at least something grilled-cheese-like. I cut off the tips and sliced each squash into four slices, two larger inside slices and two smaller outside slices. I pre-sautéed them with garlic, roasted them in the oven, spread them with tomato spread, filled them with cheese, and fried them again. Yum. A warning for devotees of grilled cheese: This recipe doesn’t have the crispiness of a grilled cheese sandwich. It’s something else entirely, a pile of two-bite or three-bite snacks that are a little soft inside, but the softness works with the melty cheese and subtle flavor of summer squash. At a dinner of sandwich-like foods, these got finished before the regular grilled cheese. 1. Preheat oven to 375. The plan is to sauté the squash and then roast them, but you can actually grill them instead if you prefer, and they’ll be drier. 2. Carefully slice just the other bits of the top and bottom of the squash off; you want enough left that you can make four slices. 3. 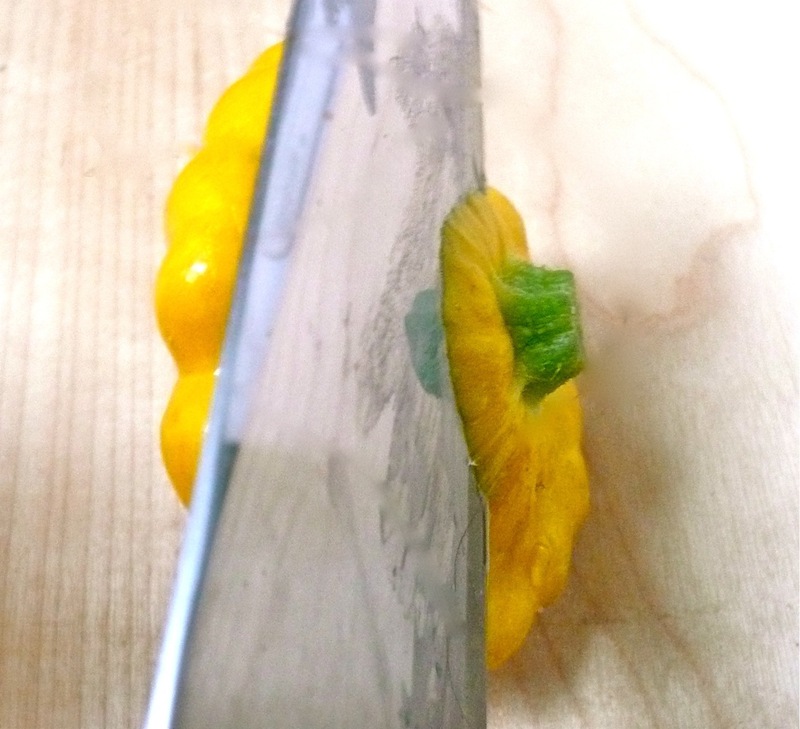 Slice the squash into four disks, two larger and two smaller. Chop up some garlic. 4. In a skillet, sauté the garlic and squash slices in butter until brown, using a little salt. The garlic is purely for flavor. You can add it into the cheese later if you like. I just snacked on mine; I can’t resist browned garlic. 5. Roast the squash slices for fifteen minutes or so. If you want to help some moisture evaporate, you can put them on a cookie-cooling rack over a baking sheet, but this isn’t necessary. 6. Slice cheese. Prepare pesto or tomato mixture if you like. 7. Take squash slices out of the oven. Match them according to size. Spoon a little pesto or tomato mixture onto each slice, add cheese, and make sandwiches. 8. Fry in butter, turning once. They’re done when they’re nicely browned and hold together well. Time to play with your food. Asparagus season has lasted into July, one of the few benefits of the cool-and-wet May and June this year. Asparagus, like artichoke and several other foods that don’t begin with A, is a funny-looking vegetable, the kind that’s prone to inspiring whimsical dishes. 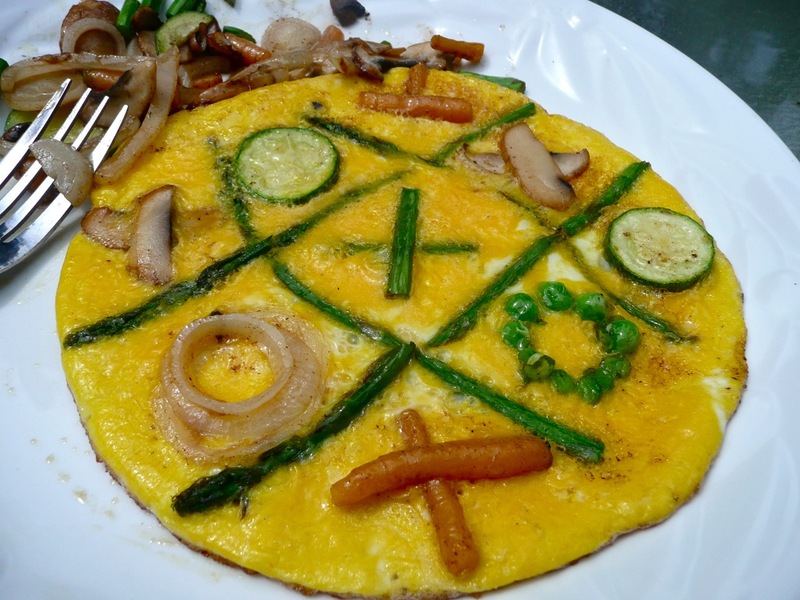 Admiring a pile of asparagus at the farmers market, I saw a new purpose for them: a tic-tac-toe board built into an omelet. Why not? The idea’s pretty simple. 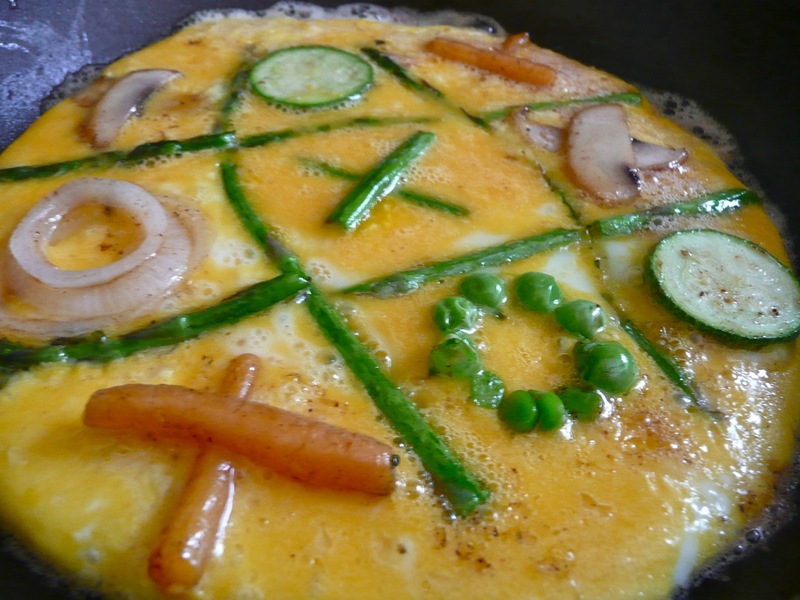 If you cook your eggs on very low heat in a non-stick or well-seasoned cast iron pan, you can arrange whatever you like on the top while the omelet cooks through. 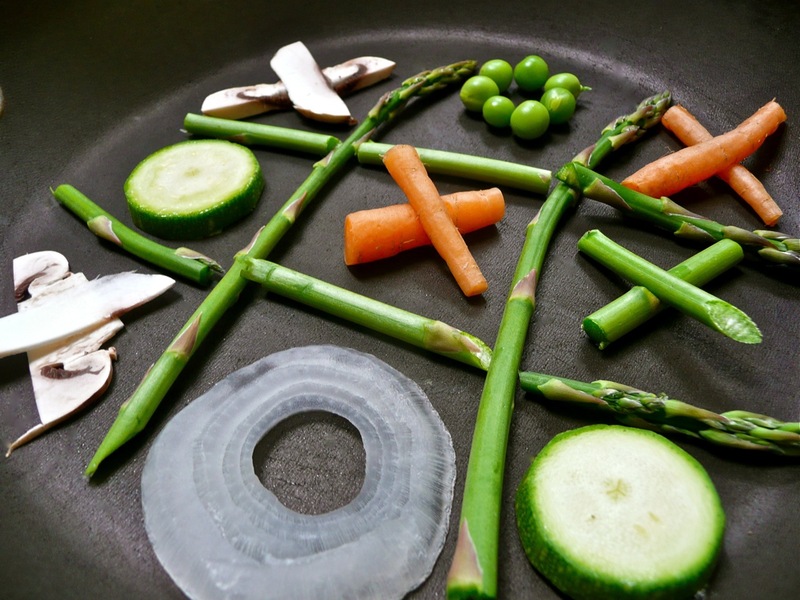 Pre-sauté your vegetables or meats. Lay down a tic-tac-toe board made of two very thin asparagus stalks one direction, and two stalks broken into pieces the other direction. 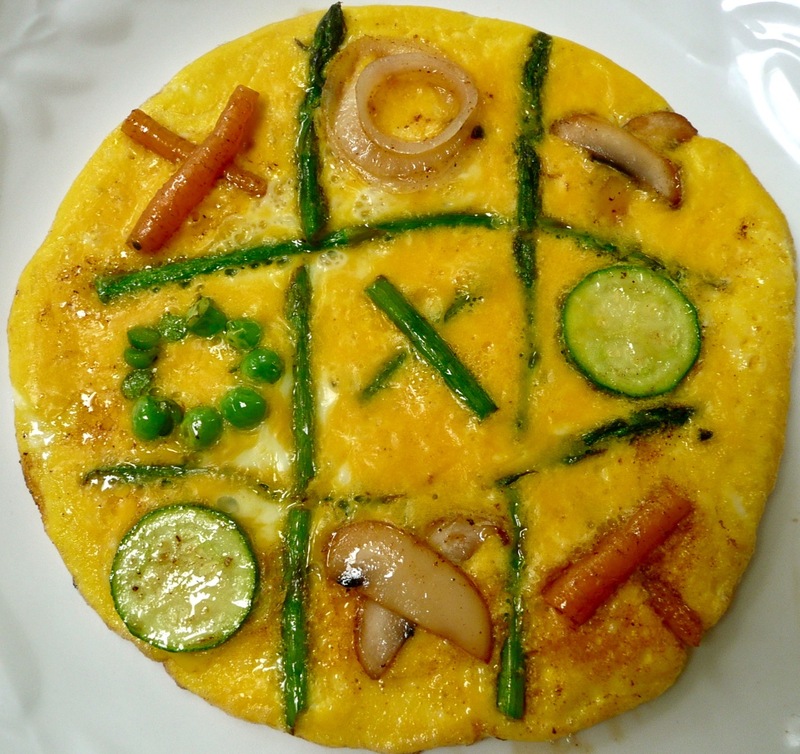 Play tic-tac-toe with edible Xs and Os, solo or with someone else. Let it cook, putting a lid on it for the last minute or so if necessary. It’s not something I’d make every week, but it’s a fun treat for kids, game/puzzle enthusiasts, or anyone who likes to play with food. Plus, it looks cool. other flavorings as you choose. Fish sauce, combined with Thai sausage, mushrooms, and hot chilis, for a Thai omelet? Fresh herbs? 1. Choose your thin asparagus stalks for the board, and your X and O vegetables or meats. You can pick exactly the number you’ll need for your omelet(s), or you can just sauté a whole bunch and pick from them later when you cook the omelet. If you’re just making one or two, or if you’re doing this for the first time, I recommend laying out the board in an empty pan to get a sense of what size things should be. This also allows you, if you’re making it solo and are extra nerdy, to make sure you’re laying out a game that will fill the board but still be logical; you can write it down if it helps. 2. Lightly sauté all these vegetables and meats in butter. Set aside. 3. You want to make the omelets one at a time. Beat two eggs with a dash of milk or cream. Set pan on low heat (I alternated between the 2 and the LOW settings). Add more butter, let it melt, and pour egg mixture into pan. In that case, cover the omelet for the last 30 seconds or minute if needed. 5. Turn off the heat and slide out of the pan onto a plate. Serve immediately. 6. Optional: If you prepped a bunch of extra sautéed veggies, you can serve them on the side. I went to Lake Chelan for an overnight this week and serendipitously caught the Chelan Farmers Market. One vendor was selling all sorts of gorgeous produce for ridiculously cheap: huge bunches of baby carrots for a dollar each, generous bundles of herbs for fifty cents, and bags of ripe red currants for a dollar. I asked her about her favorite things to do with currants. She likes adding them into salads, but also anything that allows them to brown a little, like tossing them onto grilled meats or into a hot pan in which meat has just been cooked. They might end up going on some chicken or lamb later this week, but last night I tried out using them with salmon. I broiled it with butter, tarragon, and currants on top. While that was cooking, I made a sauce kind of inspired by beurre blanc (whose consistency I still can’t get right, but I’m working on it). 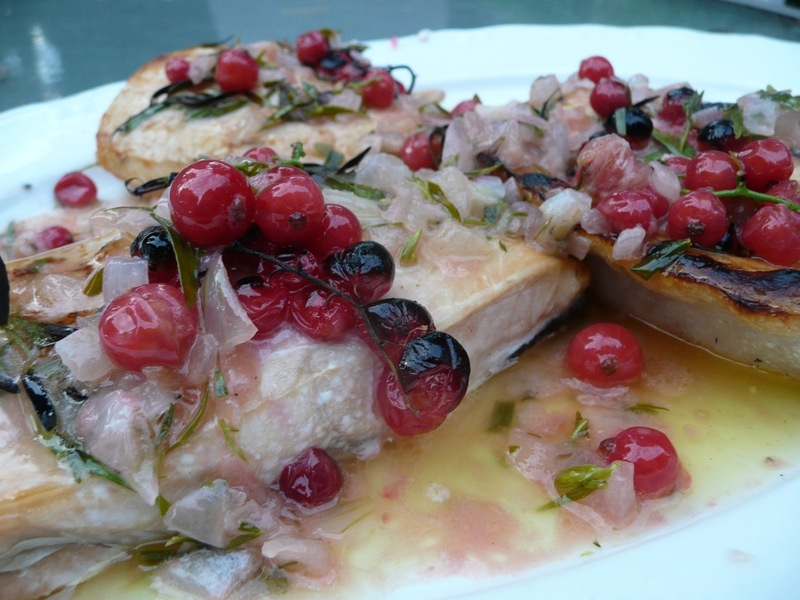 I used a big handful of fresh tarragon in the sauce, poured it out of the pan, and then turned the heat up high to cook the currants. Try it out and tell me what you think. 1. Set oven to broil. Place salmon on a baking sheet or dish. Add fresh tarragon leaves. Spread thin squares of butter all over the tops. Sprinkle on a few sprigs of red currants. Set in oven. 2. While salmon is cooking, prepare your sauce. Chop onion or shallot very fine. Cook it in butter on very low heat, adding more butter as it gets absorbed. Let it keep cooking. 3. If you’re using a thinner type of salmon, check it fairly quickly. You want salmon to cook just to the point where a butter knife slides into it easily and it’s a little translucent inside. Under the broiler, the tops are a little blackened here and there at this point usually. Take the salmon out while the onions are still cooking if it’s very thin. 4. When your onions are very clear and browned in a few spots, add more butter, lemon juice, and a dash of white wine or white wine vinegar. Cook a few minutes more. 5. Add the tarragon and stir. Turn off the heat and pour the sauce into a bowl for the moment. 6. Put the pan back on the heat with a little more butter. With the heat high, add the remaining currants. They will sizzle and the pan may start to brown. Add the other dash of white wine or white wine vinegar and let it cook a moment until it smells more like a sauce, less like wine or vinegar. It will be reddish. Pour this into the bowl of sauce. 7. Arrange salmon on a platter. Drizzle the sauce over and around it. Garnish with fresh tarragon and slices of lemon, if you like. Serve immediately.